It was a small victory in a very big war. The Third Circuit Court of Appeals decided for the second time on April 26th to uphold a 2001 federal court decision to set aside the death sentence of Mumia Abu-Jamal, a journalist, former Black Panther, and the world’s best-known political prisoner. The court had already ruled in 2008 that, due to improper instructions to the jury in Mumia’s 1982 kangaroo-court trial, his death sentence is to be replaced by life without the possibility of parole, unless the State of Pennsylvania holds a new jury trial on sentencing within 180 days. If the state fails to hold such a hearing within the time limit, the sentence automatically becomes life without the possibility of parole. Now, acting under orders from the US Supreme Court to reconsider, the Third Circuit panel reached the same decision once again. Mumia’s new legal team (replacing Robert Bryan), headed by Juddith Ritter and the NAACP Legal Defense and Education Fund, proved their competence and won this round. That’s the good news. But the “good news” is relative. How is it that sending an innocent man into the hell-hole of state prison for the rest of his life is a victory? Meanwhile, the bad news is, well, many faceted. First of all, The US Supreme court, one of the most wretched and reactionary courts ever, could overturn the Third Circuit. Philadelphia’s new DA, Seth Williams–the first black district attorney in Philadelphia history–has already announced his intention to take the case back to the Supreme Court. The Supreme Court, meanwhile, in its order to the Third Circuit to reconsider this sentencing point, acted very much as though they wanted the lower court to uphold the original death sentence. They did this by waiting for months until they had the opportunity to rule on another case, that of an out-Nazi racist murderer in Ohio named Frank Spisak, in which lower courts had also set aside a death sentence on the grounds of faulty instructions to the jury. But the Spisak case was very different from Mumia’s. In Mumia’s case, the jury was clearly led to believe that they had to be unanimous on both aggravating and mitigating circumstances in deciding the sentence. This was a clear violation of the Mills v Maryland precedent, which said that it was unconstitutional to treat these circumstances this way. While juries must be unanimous in imposing death on the basis of aggravating circumstances that they all agree on, one juror alone is enough to decide that a mitigating circumstance dictates he or she can [or should] oppose a death sentence. The Spisak case was clearly different from Mumia’s, in that the instructions to the jury were not so confusing on this point. Yet the Supreme Court, immediately after overturning a lower court and ruling for death for Spisak, ordered the Third Circuit to reconsider its 2008 ruling in Mumia’s case “in light of Smith v Spisak.” The Supreme Court was thus raising its Spisak ruling to the level of a new precedent, which, if applied to Mumia, clearly renders Mills v Maryland moot, and destroys one of the most important reasons that a jury can decide against death sentences. It’s no stretch that we get the clear impression that this Court wants very badly to strengthen the death penalty–in the face of declining public support and lots of cases of innocent men on death row–and kill Mumia, in one blow. Another big hint about what the Supreme Court wants gets us right to the main problem in Mumia’s case: the Supreme Court has upheld courts up and down the line in refusing to hear the mounting and overwhelming evidence of Mumia’s innocence! For the courts, the “guilt phase” of Mumia’s case is over. He’s been deemed guilty, and that’s that, evidence be damned. That the Supreme Court has no qualms about executing the innocent was shown recently when the justices rejected a final appeal from Troy Davis, another innocent black man on death row, in Georgia. To do this, they had to ignore admissions from all the relevant witnesses (with the exception of one who is suspected of being the actual shooter), that they lied under police pressure to condemn Troy Davis. In order to convict and uphold Mumia’s alleged guilt, the courts had to ignore the prosecution’s manufactured false confessions, invented weeks after the fact by cops who were prompted by the prosecutor; manipulated evidence including handling the alleged weapons with bare hands; and “witnesses” who were intimidated and coerced into saying they saw what they didn’t see. All of these illegal tactics were used, yet no court has overturned the conviction because of them. Meanwhile, the real evidence–including witnesses who saw the real killer or killers run away, and a witness (William Singletary) who said Mumia didn’t shoot anybody, but who was not called to testify because he was driven out of town under heavy police pressure–should have proven Mumia’s innocence from the start. But more evidence of innocence has come in since the trial, including key witnesses such as Cynthia White and Robert Chobert admitting that they lied; another man, Arnold Beverly, who confessed (and passed a lie detector test) saying that he “and another guy” were hired by the mob and corrupt cops to do the “hit” on police officer Faulkner; and photos of the crime scene, which were offered to the police at the time but buried and never used, that show that police lied. Very little of this has ever been heard in court, and none of it has been used to throw out this blatantly obvious frame-up. Ignored evidence is just one part of the persecution of Mumia Abu-Jamal. Ignoring precedent is a big second. In making its flat-out rejection of Mumia’s appeal against his unfair conviction in April 2009, the Supreme Court had to knowingly violate its own well-established precedent in Batson v Kentucky–the 1986 ruling which said that purging a jury on the basis of race was unconstitutional. One of the best-known legal precedents in modern US history, Batson required that convictions be thrown out for even one incident of racially-based juror exclusion. And, it was to be applied retroactively. In Mumia’s 1982 trial, the prosecutor used at least ten out of 15 peremptory challenges to exclude blacks for reasons that were not applied to prospective white jurors. Many other precedents have been broken as well by appellate courts, which were then upheld by the Supreme Court. The Third Circuit reversed a well-established rule preventing prosecutors from undermining the principle of “innocent until proven guilty beyond a reasonable doubt” in their summations to the jury. In Mumia’s case, the prosecutor said that Mumia would go free immediately if acquitted, but would get “appeal after appeal” if convicted, thus saying to the jury that if in doubt they should convict, not acquit. Having ruled against this practice in an earlier case involving the same prosecutor, the Third Circuit upheld it in Mumia’s case, and this in turn was upheld by the Supreme Court. In yet another case, the Third Circuit later restored the earlier precedent on this issue. “Innocent until proven guilty beyond a reasonable doubt,” along with the right of habeas corpus, is perhaps the most fundamental of all legal precedents, predating the US legal system itself. The whim of the feudal lord to execute whom he pleased, has (supposedly) been replaced in bourgeois society by the rule of law. And if the state has failed to really prove guilt, or has ignored new evidence of innocence, but is still holding the prisoner, under habeas corpus the state must explain why it is still holding the person. But in the US, where the term “lynch-law” entered the language, and where the legal system is based largely on the law of the slave-holders, both of these fundamental principles have been thoroughly undermined. In the Supreme Court’s Herrera v Collins decision, and in the 1996 Anti-Terrorism and Effective Death Penalty Act (AEDPA) signed by Democratic President Bill Clinton, US legal precedent makes it nearly impossible to overturn a fraudulent conviction on appeal. The “facts” of the case as established in state courts must now generally be accepted in federal appeals courts regardless of merit, and the “timeliness” of appeal filings must be observed, thus gutting the right of habeas corpus. For US courts, if you’re outside these narrow boundaries, and especially if you’re targeted as an enemy of the state the way Mumia is, innocence is no defense! In late 2010, just before the November 9th Supreme Court-mandated re-hearing at the Third Circuit on Mumia’s sentencing, two new films were produced on Mumia’s case. One, by Tigre Hill, called “The Barrel of a Gun,” parroted the prosecution/Fraternal Order of Police slanders against Mumia. The other, produced by Educators for Mumia filmmaker Johanna Fernandez in collaboration with Big Noise Films, was titled “Justice On Trial – The Case of Mumia Abu-Jamal.” It told the true story of Mumia’s case, the contradictions in the prosecution’s “case,” and the racist law-and-order conditions in Philadelphia that gave rise to this persecution of an innocent man. Following the openings of these two films, a public debate was held in Philadelphia between the two filmmakers and allies, on the merits of Mumia’s case, on the night prior to the November 9th hearing. On the podium before a large crowd were Tigre Hill, the pro-police filmmaker, and Seth Williams, the new DA of Philadelphia, defending Mumia’s guilt. Arrayed against them were filmmaker Johanna Fernandez of Educators for Mumia, together with Michael Coard, a lawyer who has worked with Mumia’s lawyers in the past as local representative in Philadelphia. In this debate, the Mumia defenders, Johanna Fernandez and Michael Coard, presented evidence that the prosecution defenders were unable to answer. Specifically, Fernandez mentioned the Polokoff photos, taken by an independent photographer who was the first on the scene, which were offered to police after the shooting but never used. These photos, recently uncovered and highlighted in “Justice on Trial,” show clearly that police manipulated evidence at the scene. The photos confirm that Chobert’s taxi was not parked behind police officer Faulkner’s car, as alleged at trial (Chobert admitted this fact to a defense investigator earlier). This discredits his evidence, which was that because of his position behind the police car, he saw the shooting. He did not. The Polokoff photos also show that there are no “divots,” or bullet impact marks, on the sidewalk, where the fallen police officer, Faulkner, was supposed to have been shot at point blank range by Mumia, who allegedly fired “four shots, one of which hit” officer Faulkner, according to the prosecution. A recent experiment conducted by researcher David Lindorff, and journalist Linn Washington, has determined that such “divots” would have had to be there. But they weren’t. This demolishes the prosecution “theory” of the case. In the debate, DA Seth Williams repeatedly replied, when presented with new evidence such as this in Mumia’s case, that “you can’t just keep making things up,” to, in his view, “change the story.” Change the story? It was the corrupt trial that changed the story. Williams, and Tigre Hill, just repeated over and over again that Mumia did it, because the trial said so. Of course the trial “said so,” because it was rigged from beginning to end, by a racist, pro-prosecution judge. But perhaps the most important thing Williams said had to do with the myth that Mumia never publicly defended his innocence, or said what happened. Mumia always proclaimed his innocence. But having earlier been advised by lawyers not to speak on the specifics, and advised by new lawyers in 2001, he filed an affidavit on the events. Michael Coard referred to this affidavit in the debate, but had no time to elaborate. We provide here some elaboration. This description of the events, emphasizing that Mumia arrived on the scene only after the officer was shot, matches that of the two most important witnesses, who have never been properly heard from by the courts: Arnold Beverly, and William Singletary. Witness William Singletary confirms the beating, and adds a telling detail, which confirms his account. According to Singletary, the cops picked up the wounded Jamal, three on a side, and rammed his head into a pole while shouting, “Ramp, Ramp, Ramp.” (Statement of William Singletary) Unbeknownst to Singletary at the time, Ramp was the name of a cop who had been killed by “friendly fire,” in a raid on a house belonging to MOVE, a local black-centered community group in 1978. The young journalist Mumia Abu-Jamal had publicly defended and supported the arrested MOVE members (now called the “MOVE 9″), and exposed this murderous police onslaught in his radio reports. The senior officer on the scene of the Faulkner shooting, where Jamal was shot, beaten and arrested, was Alfonzo Giordano. Giordano had been involved in the stakeouts and the 1978 attack on MOVE. This explains why they were shouting Ramp’s name: the cops knew exactly who they had that night. It was second nature to them to begin not just the beating, but the vindictive persecution and frame-up of Jamal the very instant they found him. William Singletary was a businessman who owned gas stations and a towing operation, in which he had frequent dealings with the police. He therefore had no reason to lie against the police; he had every reason to support them. He was also a club owner, and was in the area of the shooting to check up on a competitor’s club. He claims to have seen the entire shooting from beginning to end. He said that Mumia arrived only after the cop was shot, arrived unarmed, and never fired a shot. But Singletary’s statement was not accepted, and the cops tried to get him to change his story to make Mumia the shooter. He refused. His businesses were promptly attacked and destroyed by cops, and he was driven out of town, with the warning that he should not be around for the trial. Singletary’s description of the events dovetails with Arnold Beverly’s description, in several important respects. They both said that Mumia had nothing to do with the shooting of police officer Faulkner, and they both agree that Mumia arrived only after the cop was shot, whereupon he was himself shot by a cop who arrived on the scene. The case of Mumia Abu-Jamal shows that the much-heralded “rule of law” in this so-called democracy is a fraud from beginning to end. For nearly half a century, Mumia has been hounded by the state’s forces of “law and order.” First targeted when he was 15 under the FBI’s counter-intelligence program (COINTELPRO) for his political work as an activist exposing police racism and brutality, Mumia was framed on the spot in December of 1981. For Labor Action To Free Mumia! But Mumia is not alone! 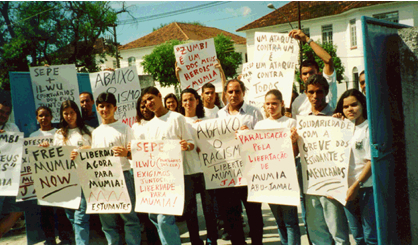 In 1995, the movement mobilized and helped prevent the execution of Mumia at that time. And in 1999, Oakland teachers held an unauthorized teach-in on Mumia and the death penalty; and longshore workers shut down all the ports on the West Coast to Free Mumia! 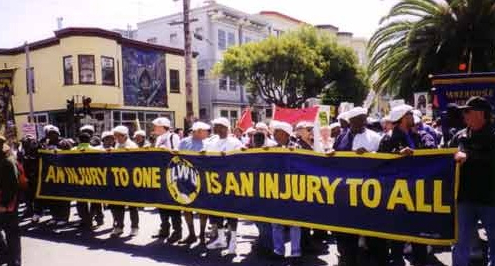 Hundreds of longshore workers, members of the International Longshore and Warehouse Union (ILWU), led a massive march in San Francisco to free Mumia. The only options before the courts for Mumia at this time are a new death sentence, or life in prison. And the only option before us, the black/brown/working class movement, who know that Mumia is innocent, is to fight back with mass mobilizations and strikes to free Mumia and all the others like him such as the MOVE 9, Troy Davis, Kevin Cooper, Lynne Stewart and Leonard Peltier. For labor action to free Mumia, and all class-war political prisoners! This entry was posted in Legal Updates, Recent News, Statements and Articles on April 26, 2011 by admin.